Miller & Kreisel (M&K) began producing subwoofers when sound systems meant music only. Back when home theater was barely a concept. But they have kept up with the market, and were in on the ground floor in producing THX-rated loudspeakers. The MX-5000THX is M&K’s current top model, incorporating two 12-inch drivers in a massive but relatively compact, sealed (unported) enclosure. One of the drivers is mounted on the front of the enclosure, the other in a recess at the bottom. The second driver loads into the same enclosure as the first. But by mounting this second woofer with its rear side facing out (into the bottom recess), and reversing its electrical phase (to keep the total external radiation of the system in-phase), slight mechanical nonlinearities in each driver effectively cancel out. This is said to reduce the even-order harmonic distortion of the system significantly. With a total amplifier power of 400W pushing the two drivers, the MX 5000THX is one of the more powerful subwoofers on the market. An internal low-pass filter allows one of two hook ups. In THX systems, or other systems with low-pass filters in the surround processor, the MX-5000’s THX/Normal switch is positioned to THX. This disables the bass-level control and sets the MX-5000’s crossover point at a fixed 125 Hz; the processor’s high-pass filter (at 80 Hz in the case of THX processors) then largely controls the upper limit of the subwoofer’s response. In Normal mode, the user has the option of setting the low-pass crossover at any point between 50—125 Hz. Powered subwoofer system, push pull, acoustic suspension with enclosed electronic crossover and power amplifier. The MX-5000THX does not include a high-pass filter for the main loudspeakers, as do many subwoofers. If your surround processor does not include one (all THX processors—and many others—do), you will want to add an outboard high-pass filter; it will not only increase the potential for a better blend between your main loudspeakers and the MX-5000, it will also increase the dynamic range of the main loud speakers and amplifiers by eliminating any need for them to handle deep bass. M&K offers three of these as options: the LP-1S (18 dB/octave, $450); HP-80 (12 dB/octave, $175 for 2 channel, $195 for 3 channel); and the VF-80 (9 dB/octave, $75 for 2 channel, $95 for 3 channel). Additional features of the MX 5000THX include a polarity reversal switch and magnetically shielded drivers. The M&K MX-5000THX was set up slightly away from a front corner in my home-theater room. After experimenting, I obtained the best results in the Normal mode, with the built-in low- pass filter set at about 60 Hz. In this arrangement, the built-in low-pass filter and the low-pass filter in the processor were working in tandem. ‘While not theoretically desirable, this “cascaded” arrangement often works. High-pass filtering was provided by the surround processors. You should not assume that this setup will be best for all rooms and systems. The rest of the equipment used in the listening tests was the same as described in the review of the B&W 800ASW. I auditioned the M&K MX-5000THX after extended exposure to both the Velodyne ULD-18 THX and the B&W 800ASW. None of these three subwoofers ran away and hid with all the honors; they were, individually and as a group, simply too good for that. The M&K more than held its own. Though my informal measurements indicated that a pair of the B&Ws went lower than a single MX-5000, the M&K stood out by the sheer sense of authority, crunching impact, and startle power that it brought to the deepest bass. It excelled on both music and films. With the former, the M&K was a little richer and fuller-sounding than many audiophiles are accustomed to, but it never fell into the dreaded “sub- woofer boom” mode. It maintained its definition on a wide range of musical material, from percussion, to organ, to double bass, and everything in between. Before transitioning from CD-based material to films on laserdisc, I slipped The Great Fantasy Adventure Album (Telarc CD-80342) into the player and cranked up “T-Rex” and “Jurassic Lunch.” These are pure demonstration, sound-effects materials—definitely over the top, definitely hokey, but matching anything else in my test arsenal for stretching a subwoofer’s capabilities to the limit. Use them at your own peril with small loudspeakers and subwoofers with limited power-handling! The bottom-end power and clarity that the MX-5000 brought to this material was awesome; it had been impressive on the other two subwoofers in the test, but not at all like this. If a real T-Rex were in the room, he’d be running for cover. So, was the M&K the best sub- woofer of the bunch? In some respects, yes, though it lacked the mid and upper bass tightness and clarity of the Velodyne ULD-18 THX. The latter was more refined overall, but never failed to come through in the crunch. James Bond-like, if you will. The M&K, on the other hand, was Attila the Hun, less inclined to show restraint even when called for. In comparison, a pair of B&Ws had output and bass extension to spare, though with a little less clarity than either the Velodyne or the M&K. Think Arnold Schwarzenegger in True Lies. But the M&K had an Achilles heal. While it handled most of my favorite bass torture-test film scenes impressively, it exhibited some surprising dynamic range limitations. Yes, the opening-title drum-roll from Geronimo was extremely powerful and clear, the bass power in the fire scenes from Back Draft was as dramatic as I have ever heard it, and the T-Rex growls from Jurassic Park were almost too energetic; it felt like a tank was steamrollering through my living room. But at other times, the M&K overloaded on material that posed no challenge to either the B&W 800 or the Velodyne ULD-18. I’m talking about very high playback levels in a large room. And Santa Fe’s 7000-foot altitude extracts a 2 to 3 dB sensitivity penalty— and thus a 2 to 3 dB penalty on the maxi mum output of a loud speaker. Nevertheless, all of the subwoofers here were operating under the same conditions. 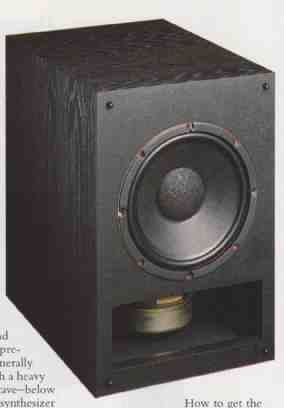 The overloading of the M&K varied from a mildly “pinched” quality to clear signs of woofer distress. And the material on which it would overload seemed completely unpredictable, except that it generally appeared to be material with a heavy content in the bottom octave—below 30 Hz. For example, the synthesizer bass on “The Long Ships” from Enya’s Watermark (Geffen 9 24233-2) over loaded noticeably—a first in my experience. But the above-noted selections from The Great Fantasy Adventure Album displayed only the slightest hint of strain. On Jurassic Park, the M&K handled the brachiosaurus “stomp” without a hitch, but overloaded on the bass transients in the background music as the helicopter lands on the island. The explosions near the beginning of chapter 4 of True Lies (played back in AC-3) went without a hitch, but a brief bass thud (occurring immediately following the first volley of explosions, just after Arnold knees a guard) overloaded the M&K. As did the helicopters in Forrest Gump (also played back in AC-3). And when a single subwoofer overloads— sometimes even when it just approaches overload—its location becomes localizable, a quality which makes the overloading all the more audible. Subwoofer designers have to trade off a number of conflicting requirements. How to get the deepest bass in the smallest cabinet at the highest level without overloading. In doing so, they must make certain assumptions, particularly about the playback volume and the size of the user’s room. In many important ways, the M&K was my favorite subwoofer in the group. Neither of the others—nor any other sub- woofer I have had in my system—could approach its ability to make a listener want to jump up and flee with the onset of a particularly brutal bass transient. But in my room—admittedly very large at 7000 cubic feet—the M&K was the most likely to throw up its hands and say “too deep, too loud.” It was the only one of the three subwoofers I reviewed in this issue that, in my room, I really felt needed to be used in multiples. I strongly suspect that two MX-S000s would be dynamite and answer my concerns, though at a significant price penalty. In a more typical room—even a large one—it is unlikely that you will encounter any such problem. In that event, the MX-5000THX would be right up there with the best subwoofers, and, in some respects, at the head of the pack.